Image: Rick Bartow, Creation of Crow (detail), 2014, acrylic on canvas, 36 x 48 in. Courtesy of the artist and Froelick Gallery, Portland, OR © Rick Bartow. Los Angeles, CA (April 2, 2018)—Occupying an interstitial realm, artist Rick Bartow’s work transcends the notions of Western and Native art, realism and abstraction, and the traditional and contemporary. The first comprehensive exhibition on this important American artist and member of the Mad River Band Wiyot tribe, Rick Bartow: Things You Know But Cannot Explain examines forty years of the artist’s work across a variety of media. On view from May 12, 2018, through January 6, 2019, at the Autry Museum of the American West, the deeply personal exhibition references and responds to the impact of colonization while emphasizing Bartow’s contributions to art history and his role in pushing contemporary art in directions both cultural and inclusive. Bartow began his practice in the late 1970s following his service in the Vietnam War and after a period of recovery from PTSD and alcoholism. 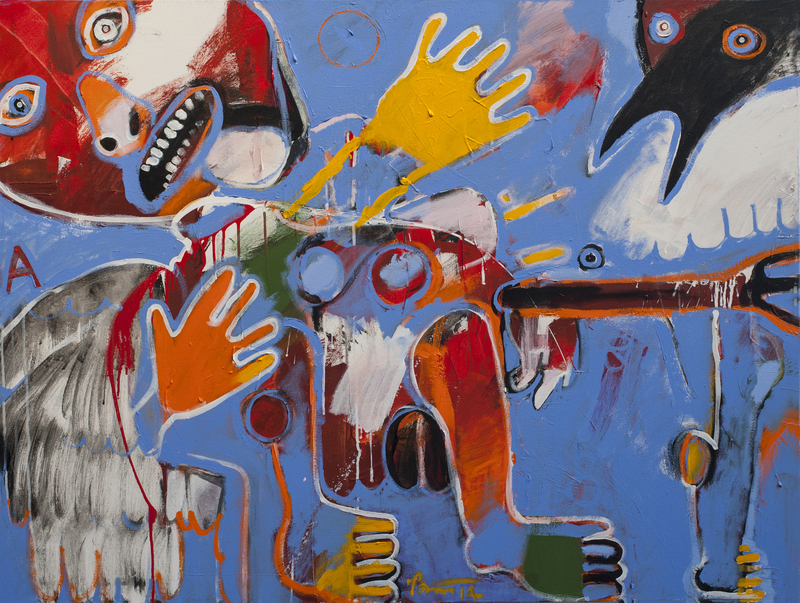 Drawing inspiration from diverse sources, his art is emblematic of a groundbreaking generation that fundamentally shifted expectations and understanding of Native American art while engaging in a global conversation about art, trauma, and identity. However, Bartow’s oeuvre—which includes large-scale paintings, drawings, prints, and sculptures—is intensely personal, synthesizing Native American culture and iconography, Western European stylistic models and methods, and Bartow’s own experiences with war, addiction, and death. Filled with ghostly forms—neither fully animal nor human—that morph before viewers’ eyes, subtle color combinations, and deliberate marks that foreground the artist’s presence, Bartow’s pieces demonstrate a close engagement with the twentieth-century masters, including Francis Bacon, Robert Rauschenberg, and Jean-Michel Basquiat. Haunted by his experience in the Vietnam War, he used his practice to exorcise personal traumas and to recharge his body and mind. In the artist’s dynamic paintings and sculptures, motifs from Native art and rituals engage with locations and experiences spanning from his native Oregon coast to his global travels. The exhibition, organized by the Jordan Schnitzer Museum of Art, University of Oregon, features over 100 works and is organized in five thematic sections: an Introduction; Self, which foregrounds Bartow’s depiction of his personal story, as well as his inspirations, struggles, and presence in imagined and physical environments; Dialogue, which speaks to the storytelling aspect of his work and the conversation between past and present; Tradition, which traces the multiple lineages and histories that inform his work, including art history, world history and myths, family traditions, and Native practices; and Transformation, which charts both the transformative power of art-making in the artist’s life as well as images of transformation—such as shape-shifting figures and masks believed to metamorphose their wearers—that populate his sculptures, paintings, and drawings. Support for the exhibition is provided by the Ford Family Fund of the Oregon Community Foundation, Arlene Schnitzer, the Coeta and Donald Barker Changing Exhibitions Endowment, The Harold and Arlene Schnitzer CARE Foundation, a grant from the Oregon Arts Commission and the National Endowment for the Arts (a federal agency), the Ballinger Endowment, Philip and Sandra Piele, and JSMA members.